We spend a lot of time on the BuzzPlant blog talking about authenticity, a subject that may not appear (at first glance) as exciting as live-stream social networks and data-proven Twitter strategies. But, trust me, authenticity has been and will be more important than the latest-and-greatest trends in social media marketing. The reason is simple: authenticity is at the core of everything your brand does. Your ability to shoot compelling Periscope content or engage with Twitter followers depends entirely on your brand’s level of authenticity. Figure out authenticity first. Then work on the particulars of your social media marketing. “Authenticity” gets tossed around a lot these days as a buzzword. Brands call themselves authentic without understanding what authenticity really means because they know consumers are attracted to authentic brands. True authenticity goes much deeper. Authentic brands keep the attention off themselves, and focus on their audience’s interests. Authentic brands create a community bigger than themselves. Authentic brands create a story worth sharing. To answer the original question above, “No.” Authenticity is not just a vague, feel-good term. A new infographic by Bonfire Marketing shares statistics that prove brand authenticity (in social media marketing and elsewhere) delivers real, tangible ROI. Some of their insights are quoted below. 63% of those surveyed buy from authentic brands over competitors that hide their true selves. #3 Economic Indicators: While the hunger for authenticity is a global effect, those in fast growing economies are twice as likely to invest in authentic brands as respondents in slower-growing countries. #4 Top Five Authentic Global Brands: McDonald’s, Samsung, Apple, Carrefour, and KFC. Does Your Brand Create Authentic Content? Would you say that authentic content is at the core of your brand? 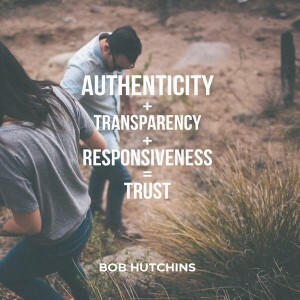 Do you think authenticity and authentic brand content really matters? Or can marketers achieve the same short- and long-term results without troubling themselves with an emphasis in authenticity?